Full disclosure: I was given a copy of this book by the publisher for review. They all do excellent work. Phil Lowe and Garrett Hack in particular are a couple of my woodworking heroes, whom I've been following for years. The book is divided into 3 parts, with excellent photography to capture the fine details. In addition to western style tools, there are several articles on Japanese tools. 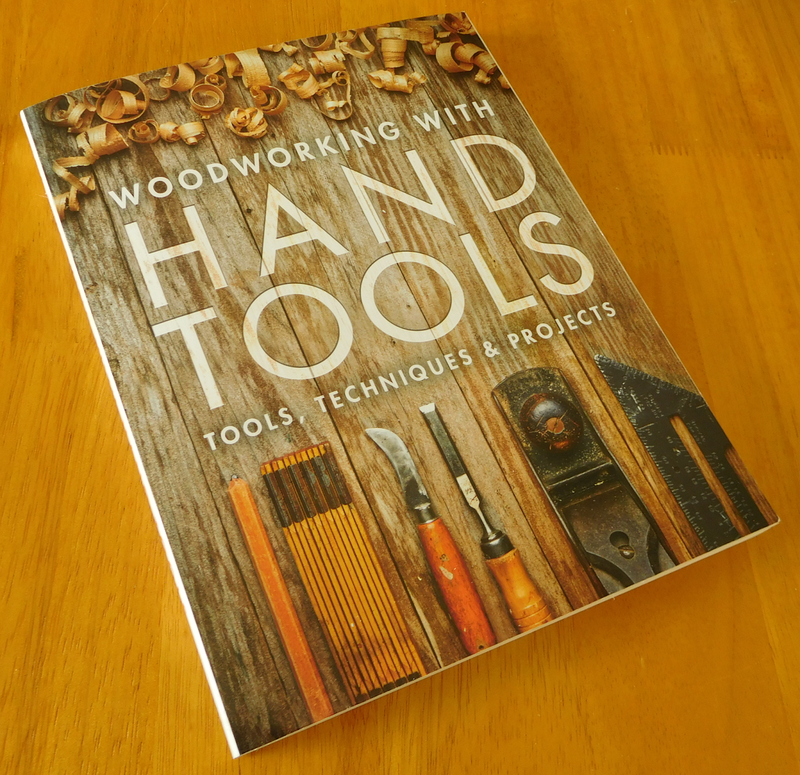 It's an excellent resource for anyone interested in learning or expanding hand tool woodworking skills. In general, the articles cover the details of fine work after the parts have been roughed-out and dimensioned, although there is one article on rough stock preparation with Japanese tools that applies equally well to western tools. 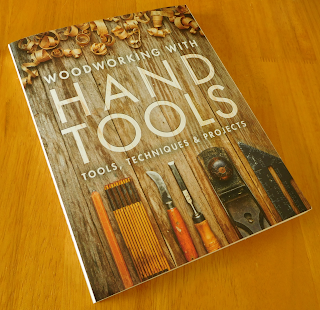 Most of the authors use a combination of power and hand tools in their day to day work. They typically do the rough work of breaking down lumber and getting it close to final dimensions on machines, then shift over to hand tools for the final dimensioning and detail work. Part One contains 14 articles on tools. In addition to a general article covering an essential hand tool kit, they cover squares, gauges, and calipers; and scrapers, specialty planes, chisels, and small handsaws. Three of the articles cover sharpening: card scrapers, cabinet scrapers, and using diamond sharpening stones. Vic Tesolin's article "4 Planes for Joinery" is my favorite in this section. These specialty planes are invaluable for fine tuning precise joints. Part Two contains 12 articles on techniques. They cover general tool use techniques, stock preparation, fine fitting and cleanup, mortise and tenon and dovetail joinery, and custom moldings and scratch stocks. 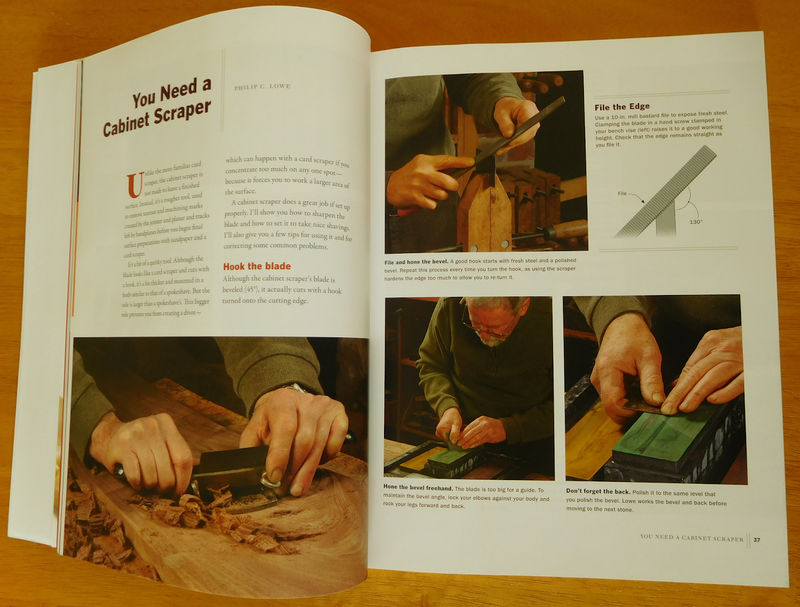 My favorite in this section is Phil Lowe's "4 Chisel Tricks". This article changed the way I made tenons when I first read it in the magazine. 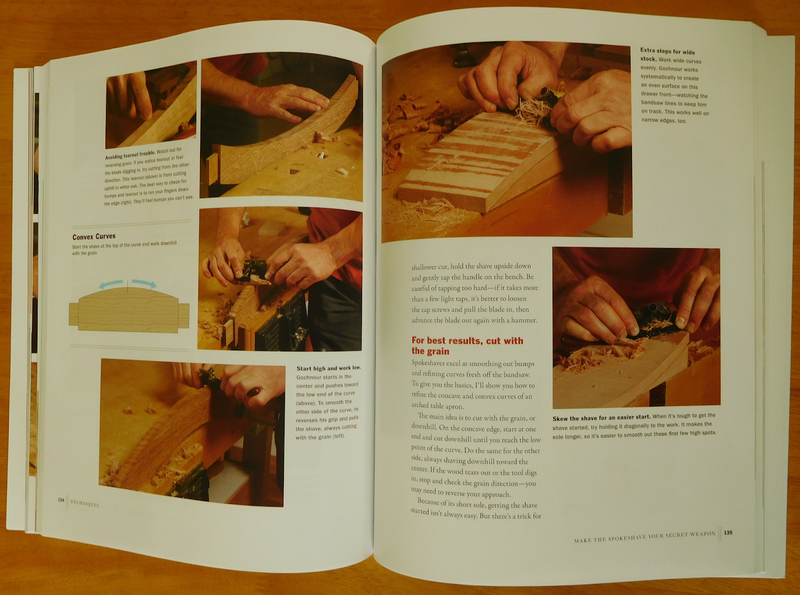 Part Three contains 7 articles on building tools and jigs used in hand tool work. They cover building custom handsaws and scrapers, specialty grooving planes, a cutting gauge, bench jigs for precision planing, a Japanese tool box, and a shaving horse. In this section, my favorite is Norman Pirollo's article "4 Bench Jigs for Handplanes" (I guess the reason my favorites follow a theme of 4 is that they reflect versatility!). These jigs are critical to efficient and precise work. I always tell people the shooting board is the precision secret weapon for hand tool work. While I've called out a few personal favorites, all of the methods shown in all the sections are excellent. They reflect their authors' long experience with the craft. The layout is easy to read and follow. Here Phil Lowe explains how to sharpen and use a cabinet scraper. Closeup photos capture details of the tools in use. Here Chris Gochnour shows how to tackle concave and convex curves with a spokeshave. What's great about a book like this is that no matter how much you know, there's always something new to learn. It might be an entirely new way to tackle a task, or a subtle refinement of a method you already use. These increase your versatility, allowing you to adapt to the situation when things aren't going as expected. In my case, this book finally gave the best explanation I've seen for why to burnish a card scraper on its flat faces, and the result of that step. I joke that I collect scraper sharpening methods the way other people collect baseball cards. This was a refinement of my current method, and it worked wonderfully when I tried it. There were several other instances like that where just one or two photos were sufficient to add to my repertoire. Each increment in technique like that improves my capability. The key to making these skills work is to practice them. In fact, the first article on techniques covers a set of skill-building exercises. It's useful to take the methods outlined in all the articles and first try them on some softer wood that won't fight you so much, then try them on the harder woods you plan on using for actual projects. This book is an excellent compendium, covering a broad range of techniques. We're very lucky in New England to have a rich concentration of these excellent instructors. Through membership in the Society of American Period Furniture Makers (SAPFM) and participation in Lie-Nielsen Hand Tool Events and open houses, I've had the privilege of meeting and watching 6 of the 17 authors, particularly Phil Lowe. I've incorporated a number of their techniques into my work. As a bonus, here's a video of Phil showing the cabinet scraper sharpening method in his article. I recorded this for him at one of his SAPFM demonstrations. Always great to learn from Phil Lowe. "Dad, I want to build a box." RFC: What To Do With Green Apple Wood? How Do I Get Started With Hand Tools? How Do You Go About Your Sharpening Now It's A Year On? How Long Does It Take To Get To MIT? I'm a software engineer and woodworking hobbyist in central Massachusetts. "Hobbyist" means I'm free to spend unlimited amounts of time, energy, and money without expecting any return on my investment. I'm a firm believer in see one, do one, teach one.